Steven E. Petersen : ​Colors illustrate different networks of the brain. Researchers have discovered that injuries to a brain hub (top), where the boundaries of several networks come together, can be much more devastating than similar injuries in other parts of the brain (bottom). Injuries to six brain areas are much more devastating to patients’ abilities to think and adapt to everyday challenges than damage to other parts of the brain, scientists at Washington University School of Medicine in St. Louis have learned. Brain mapping highlighted the regions, which are “hubs” where multiple brain networks come together. The networks make it possible for parts of the brain to work with each other to complete cognitive tasks. The findings offer a new perspective on how injury impairs brain function. This may help better predict the effects of strokes, trauma and other brain damage and one day could lead to reassessment of the risks of some brain surgeries. Petersen noted that some psychological disorders, such as schizophrenia, disrupt a similarly broad range of brain functions. He speculated that problems with the sites highlighted by the new study may contribute to these conditions. The findings are available online from the Proceedings of the National Academy of Sciences. 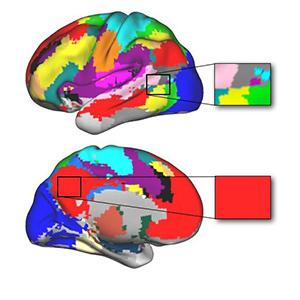 Petersen and his colleagues at Washington University School of Medicine identified the sites by mapping brain networks, which make it possible for parts of the brain to work with each other to complete cognitive tasks. Their maps highlighted hubs, regions where the boundaries of multiple networks come together in one spot. Scientists had not previously identified the regions as areas that made important contributions to brain function. To test their theory, the researchers collaborated with colleagues at the University of Iowa, including Daniel Tranel, PhD, and David Warren, PhD. Tranel heads the Iowa Neurological Patient Registry, a database of patients who suffered strokes and other brain injuries. In addition to noting the location of damage, the database includes detailed information on behavioral and cognitive effects of the injuries. The information includes findings from tests of memory, speech and reasoning, and assessments of the patients’ abilities to deal with “real-world” problems such as holding a job, getting along with family members and going through daily routines. The latter were measured via questionnaires and reports from patients’ family members. The scientists identified 19 patients with brain injuries centered on one of six hubs. The researchers compared them to 11 patients with similarly sized injuries in one of two areas of the brain far from any hubs. According to Petersen, the findings may help explain anecdotal reports of patients who suffered relatively small brain injuries yet experienced surprisingly significant disabilities and impairments. The researchers are using the database to investigate other potential brain hubs. This work was supported by National Institutes of Health (NIH) Grant P01 NS19632, NIH Grant R21NS061144, the McDonnell Foundation Collaborative Action Awards, Simons Foundation Award 95177, National Institutes of Mental Health Grant R01 MH062500, and NIH Grant F30 MH940322. Warren DE, Power JD, Bruss J, Denburg NL, Waldron EJ, Sun H, Petersen SE, Tranel D. Network measures predict neuropsychological outcome after brain injury. Proceedings of the National Academy of Science, Sept. 30, 2014.Washington University School of Medicine’s 2,100 employed and volunteer faculty physicians also are the medical staff of Barnes-Jewish and St. Louis Children’s hospitals. The School of Medicine is one of the leading medical research, teaching and patient-care institutions in the nation, currently ranked sixth in the nation by U.S. News & World Report. Through its affiliations with Barnes-Jewish and St. Louis Children’s hospitals, the School of Medicine is linked to BJC HealthCare.